Sharing a little Independence Day inspiration. Can anyone else not believe that July 4th is only a week away? A great way to dress for the holiday is by wearing a little blue dress, and a tank version makes a great option for a fun day in the sun. The dress I am wearing happens to be one my favorite pieces to throw on during the summer, but it's from last year, and unfortunately no longer available. I did however search high and low, and found this dress, which is very similar. I also linked other great little blue dress options below. If fact, I am in love with this swing dress, and thinking it needs to be added to my wardrobe! 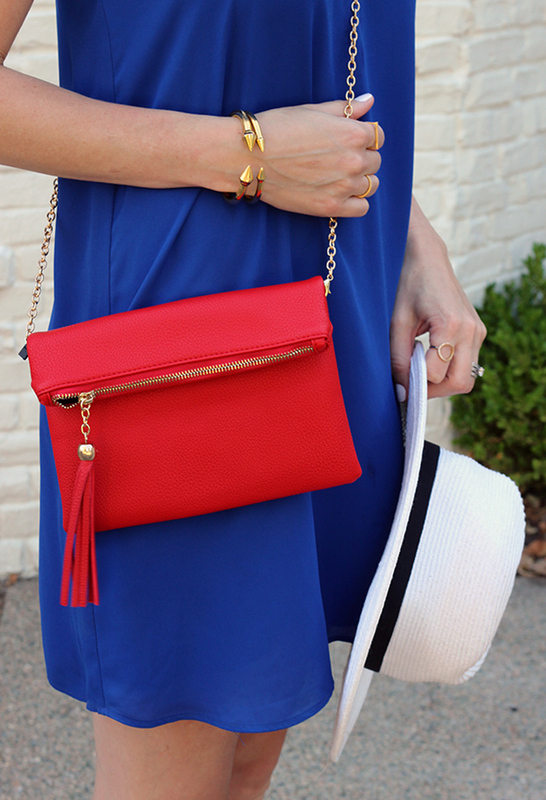 To finish my outfit, I added a pop of red with my bag, and a little white with my hat, for a fun patriotic look that I feel is not overbearing. This dress is the best! love that color! Love this casual dress, and the color is perfect on you! This is perfect for the upcoming 4th of July. You look great in this outfit. Happy Monday! Love this festive look for the fourth! That dress is perfection! Cute look! Perfect for the fourth of July! Perfect look for the 4th!! Love your dress! You looks so beautiful! Such a cute 4th of July look Rachael. I hope you have a good one coming. I definitely cannot believe we are already coming up on the 4th. This outfit is perfect! Love how the bag adds a subtle red. Fabulous. Check out our sunglasses GIVEAWAY! Such such a perfect 4th of July look! That red bag is the cutest! gorgeous dress! love the blue on you! Love this patriotic look! Go USA! Love everything about this outfit! The dress is so flattering. Hope to see you on the Wed linkup! Perfect for a hot 4th of July! The dress is so adorable and the hat is the perfect addition! Such a cute look for the holiday!! I just got some similar sandals recently! They look great with the minimalist dress. Love this patriotic look! This dress looks amazing on you!! I'm thinking a little blue dress is just as versatile & cute as a little black dress!